Viewing a thread - She's Finally Home! 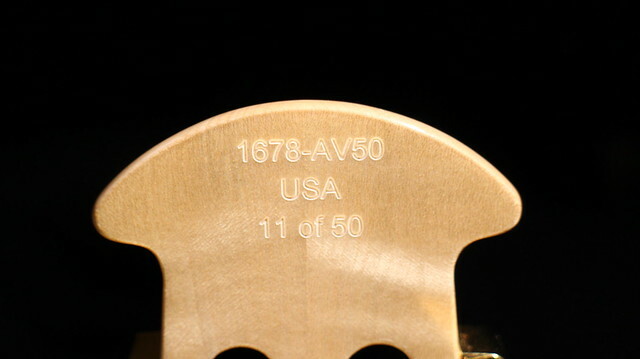 My 1678-AV50-5 USA 11of 50 has finally come home. Thanks to Mr. Pepiak, I was able to get this sent to a freind's address in California a year and a half ago. Since then, my friends have been playing her, and sending me rave reviews. Some urgent matters during this past Christmas holiday season required me to make a short 4-day trip to the States. There I met her and held her for the first time. How can you put it into words? Well, I will try...this is my 1678AV50-5 review. 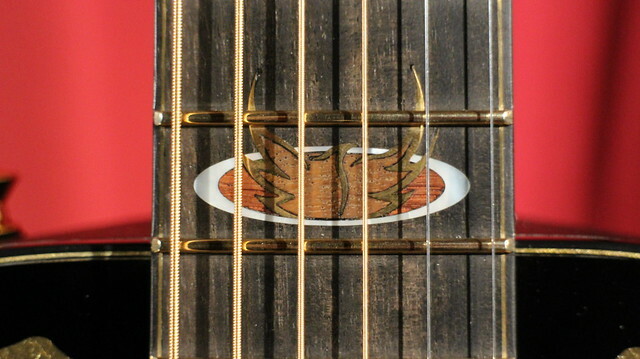 And under the hood, Ovations signature Quintad bracing pattern provides resonant tonality. 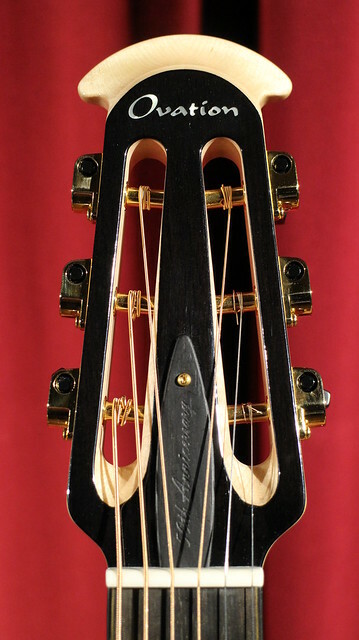 A closer look reveals, if I am not mistaken, that each brace has been scalloped, cut and shaved carefully. That means this instrument has been unqiuely voiced! Cool. As a guitar repairman, the bolt-on neck gives me a lot of peace of mind. The incomparable OP Pro Studio (Cool Tube? - yeah, they're great, but after playing through this, well... the compressor technology in the "Expressor" and the "Drive" capabilities...maybe I'm biased, but...). Mixed with mics and line-ins? Well, this is a pretty hard combination to beat! The ebony fret board with EVO Golds (and a beautiful dark brown hue) meets the body at the 12 fret placing the bridge right in the sweet-spot of the sound board. 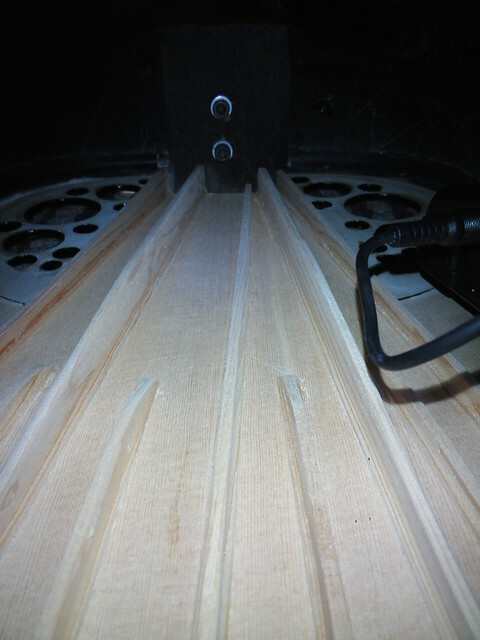 This maximizes the resonance of the entire guitar which is built with extraordinary precision endowing this instrument with what can only be described (by me anyway) as "supernatural" sustain...and the sound board has yet to be broken in! One final thought... it seems to me that the hand laid bowl on the 1678 is way lighter than my 1117-4. I would suspect they've vastly improved their hand laying process of the bowls as well. Well I gotta tell ya, the crew at the Mother Ship have just hit the ball outta the park on this one. It is so good to see O back with this kind of quality and performance. This is the O that I've grown to love. 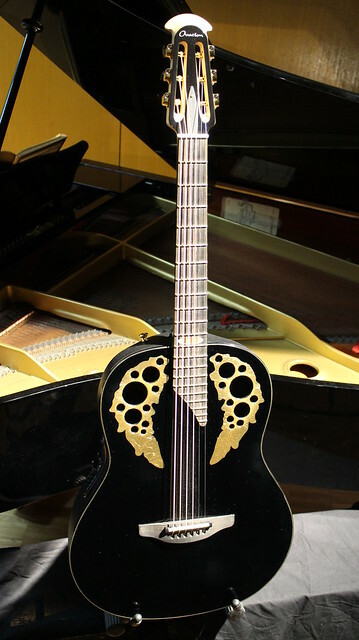 It kind of reminds me of my first strum of an Adamas back in high school. My friend owned the holy grail - one of the original 1687 Adamas. 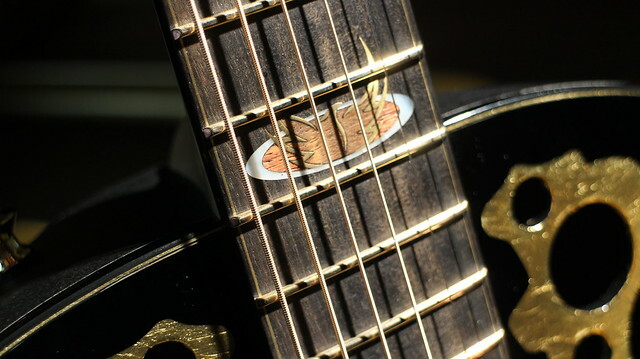 He let me strum it a couple of times (those were like over 10K bucks in Japan back then!). 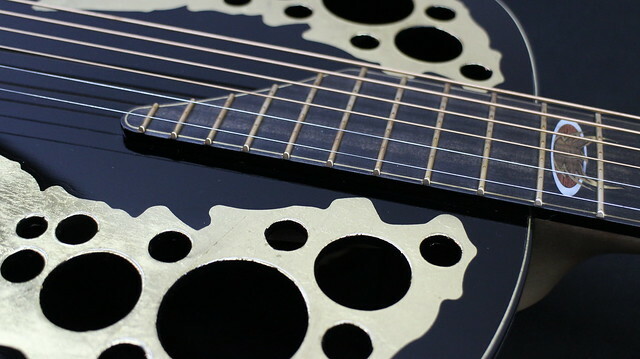 Just one strum and the whole guitar began resonanting. 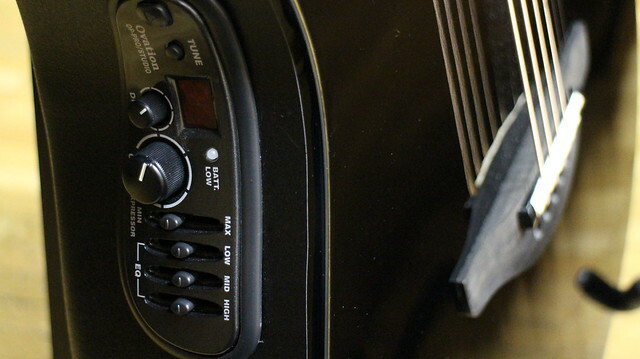 It kept resonanting and it felt like it resonated all the way into my soul (no kidding!). The instrument was mesmerizing, but way beyond any of our reaches! Forty years later, I would have never imagined that I would be able to actually own one (I noticed Bburg has this as well as the 1680-NWT Adamas Primiere. I sure would love to hear his take on how they compare to each other). Before I was really able to get intimate with her, one of my friends asked if he could borrow it. He's right in the middle of recording some new songs and he heard me playing the 1678 and fervently asked if he could borrow it for a month! Oh well, you know, in Japan where everything is so expensive (the 1678 goes for $6500 bucks retail and about $5000 street!) you learn to share the best of the best. Hording an instrument as fine as this would be tragic! In Patch's 2018 OFC Calendar he featured Bburg's 1678 in December. Patch asks, "Do Ovations come any better than this?" Patch then answers his own question saying, "No. No they do not." Subject: Re: She's Finally Home! Location: Upper Left USA Very, very nice! Location: What week? Congratulations on this masterpiece finally making its way home to you! I swear, it's like a drag race between you and Nancy as to which one can make the rest of us feel the most envy. @Arumako - "....you learn to share the best of the best. Hording an instrument as fine as this would be tragic!" Do you need my shipping address?? Location: Colorado Rocky Mountains Love the color in that fretboard. Very nice. Location: Phoenix AZ That really IS a beautiful guitar. So happy for you !!! Location: Yokohama, Japan Thanks for all the nice comments everybody! @Damon67 - Guess where the red background idea came from? Lol! @Love O Fair - If you lived in Japan, I would be glad to ship it to you. Japan is a small country and everything gets to everywhere in 2 days or less (normal shipping). 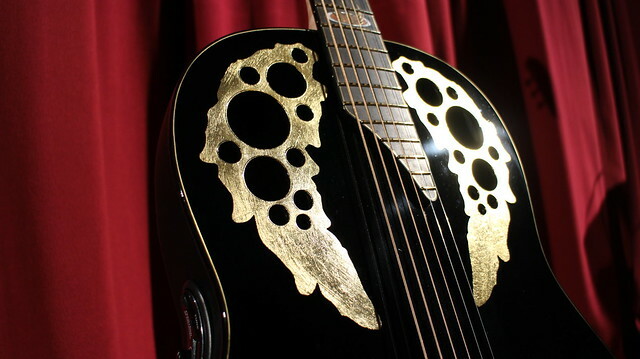 The cost is no more than about 25 bucks "one-way" for a guitar, and the Japanese never break anything! Anywhere else in the world? I don't think so! But if you ever come this way, you'd be welcome to take my 1678av50 for a spin anytime. 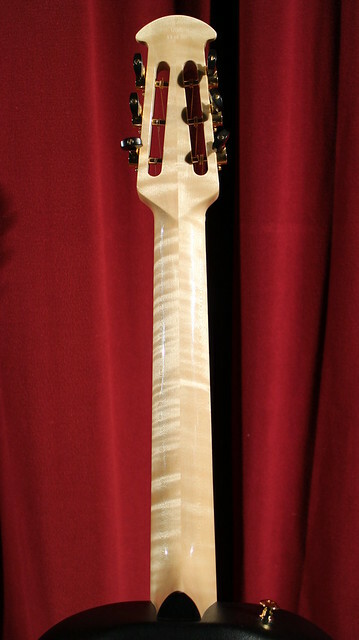 With regard to the "envy" factor, I do think Nancy's Claro Walnut O, beats this "hands-down"! 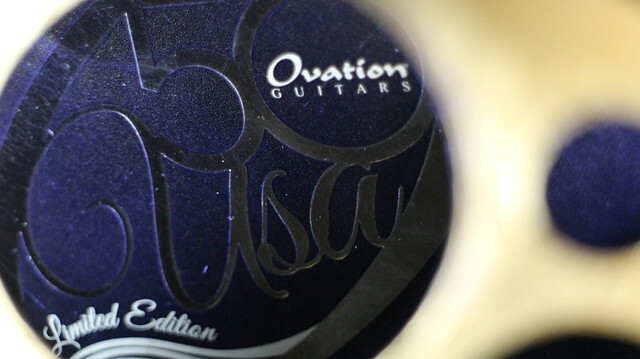 That really is a Custom Shop one-of-a-kind O! Location: What week? @Arumako - "But if you ever come this way, you'd be welcome to take my 1678av50 for a spin anytime." Okay, that does it! Pack up! We're moving to Japan. Location: Always beautiful canyon country of Utah Me come too!! Location: Indy It's a beauty. Location: NJ glad you are enjoying your guitar!!! !